The secret to the Ironfang Legion's unstoppable conquest lies buried in myth and legend! To uncover their enemy's weakness, bold adventurers must confront degenerate morlocks, journey through the deadly Darklands below the world's surface, and explore an ancient dwarven vault lost to history. But a dark legacy stands in their way. Can the PCs survive the ghosts of Ironfang betrayal and return to the light of day with the key to the Legion's defeat—or will they join generations of the dead in the cold embrace of stone? 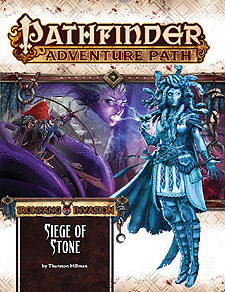 "Siege of Stone," a Pathfinder adventure for 11th-level characters, by Thurston Hillman. A gazetteer exploring the ancient dwarven Sky Citadel of Kraggodan—an underground city now besieged by human forces—plus its diverse denizens and locales, by Thurston Hillman. An ecology of the enigmatic nagas, serpentine masters of magic and intrigue, by Patchen Mortimer. A bestiary packed with new beasts of the Darklands and beyond, by Paris Crenshaw, Crystal Frasier, Thurston Hillman, and Kalervo Oikarinen.